I'm really not all that skilled at augury or divination, but I really value the Tarot as a meditation aid. My favorite is probably the Shapeshifter deck, but the Arthurian Tarot is nice too. This image is from the “classic” Rider-Waite. 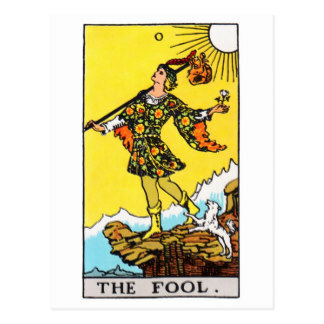 The Fool card, the so called "Zero" card is one of the more fascinating cards. By some interpretations, it's not really a part of either the Major Arcana or the Minor Arcana. It's descendent in the modern deck of playing cards (obviously) is the joker. The joker isn't always used, but in some games it's a wild card that assumes a value based on the cards around it. And that is what I think makes the Fool so unique. It can symbolize the portal to the Path of Mystery. Slightly offset from the “normal” reality, it's not easy to find unless you know what to look for and where to look. The Path of Mystery intertwines through our world and others, but you can't get on it except at the Portal. At least, at first. In this version, the Fool has his treasures carefully bound as he journeys away from the civilized world. I've seen prints where the Fool is the Wildman coming in from the Forest. The Fool is the bridge between worlds, the link joining what you know and what you can learn. The only thing that is certain about the Fool is that change is a'comin. Which gives him some rather interesting resonances with Coyote.